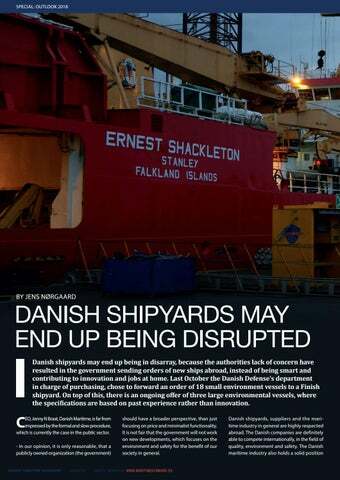 DANISH SHIPYARDS MAY END UP BEING DISRUPTED Danish shipyards may end up being in disarray, because the authorities lack of concern have resulted in the government sending orders of new ships abroad, instead of being smart and contributing to innovation and jobs at home. 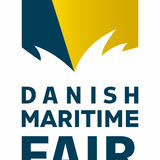 Last October the Danish Defenseâ&#x20AC;&#x2122;s department in charge of purchasing, chose to forward an order of 18 small environment vessels to a Finish shipyard. On top of this, there is an ongoing offer of three large environmental vessels, where the specifications are based on past experience rather than innovation. should have a broader perspective, than just focusing on price and minimalist functionality. It is not fair that the government will not work on new developments, which focuses on the environment and safety for the benefit of our society in general.